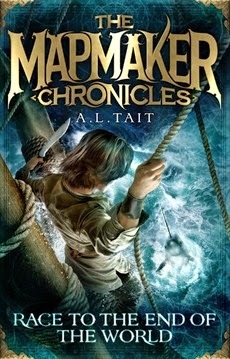 Kids' Book Review is delighted to welcome Allison Tait, author of the fantastic The Mapmaker Chronicles, to share how writing a series has differed to her usual approach to creating a story. One thing I’ve discovered in the many years I’ve been writing fiction is that there’s no one way to write a book. There’s only the way that you write a book, and you have to write a lot of words to find out your process. I think it’s the same with a series. I have friends who would never even consider writing a first sentence without a full spreadsheet of backstory, character analysis and scene breakdowns. And I have friends who write like I do. I’m not a plotter. I need to get that out of the way, upfront. I’ve always been the kind of writer who starts with an idea, or a character, and just starts writing, pushing relentlessly forward through the first draft just so I can find out what’s going to happen. If I know what’s going to happen, I lose interest – as was demonstrated memorably once when, writing a novel for adults, I wrote the ending of the story because I was worried it mightn’t be possible. It was possible, but it then took me eight months to go back to the manuscript because, frankly, why bother when you know how it all turns out? This is all well and good when you’re writing a single story, but, as I discovered when writing The Mapmaker Chronicles, is not really the way forward when you’re penning a grand adventure across three books! Interestingly, I began writing The Mapmaker Chronicles in exactly the same way as I begin all my manuscripts. I started with a problem – how did they map the world? – thanks to a question asked by my sons, and I began with a character, Quinn, the boy who really didn’t want to go. And then I started writing. My agent had asked me if I had any ‘ideas for kids’. I replied that I had ‘a random idea about mapmakers’. She said, ‘write me a synopsis’. I replied, ‘that won’t work, how about I write the book and we’ll see what it looks like?’. I knew that anything to do with a race to map the world wasn’t going to be one book, but I originally wrote the first book thinking that it would involve a series of six (I was thinking in continents, and steering clear of the poles). My agent loved the first book, but needed an outline to submit to publishers. I wrote a one-paragraph sketch for each book in the series. As it turned out, Suzanne O’Sullivan, my very clever publisher at Hachette Australia, decided that three books would work best at first, which tightened the time-frame and kept the pace relentless. I got out my outline, and reassessed it, moving things around to keep the motivation and storyline strong. The unused ideas went into a file titled ‘to think about later’, and I got on with the job of writing two 50,000+ word children’s novels in one year. The thing that surprised me most about writing my first series was how hard my subconscious worked throughout the process. I found myself writing things in book three (Breath of the Dragon) that brought to fruition things I had seeded, unknowingly, into book one (Race to the End of the World). Connections were constantly being made in my brain, as I focused on getting the story down, and they came together in the most unexpected ways. There is no doubt that book two (Prisoner of the Black Hawk) was the most difficult book of the three to write – but, then, the middle of any project is always the hardest. Structurally, I was aware, again almost without thought after years and years of reading, that I was dealing with a three-act structure, not only with the over-riding narrative, but also as a the foundations for each book. Each book had to be complete on its own, whilst adding to the overall journey of our hero. In hindsight, I can see all of this. In practice, while I was in the throes of writing The Mapmaker Chronicles, I was absorbed in the task of finding out what happened next. Because, as I found out, a one-paragraph sketchy outline does not a story make, and characters always take on a life of their own. There is always more to discover, and extraordinary tangents to follow. Even the ending is subject to change. Allison Tait is a multi-genre writer who has more than 20 years’ experience in magazines, newspapers and online publishing. 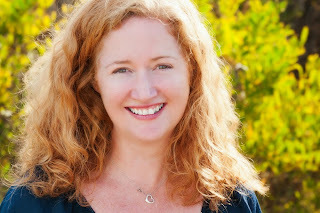 Her children’s novel The Mapmaker Chronicles: Race to the End of the World was published by Hachette Australia in October 2014. It’s the first in a trilogy that’s is already garnering her a legion of young fans across the country. Book two, Prisoner of the Black Hawk was published in April 2015, with book three, Breath of the Dragon, to follow in October 2015. 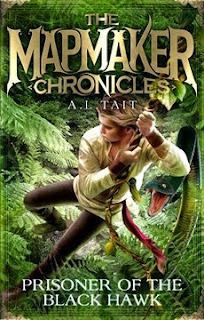 Visit The Mapmaker Chronicles website for more information about the series and Allison's Facebook page for more information about her books and writing. You can also find Allison's answers to our 12 Curly Questions here. Awesome interview!! I write exactly the same way. Thanks for sharing your process Allison!